A cold front will make its way through South Louisiana tonight through Sunday morning bringing showers, gusty winds, and chilly temperatures. Shower activity will mainly be tonight through the morning hours tomorrow. Sunday morning temperatures will be in the upper 40s but wind chill values will be in the low to mid 40s due to northerly winds that can gusts as high as 25-30 mph. Afternoon highs will be well below average in the upper 50s. 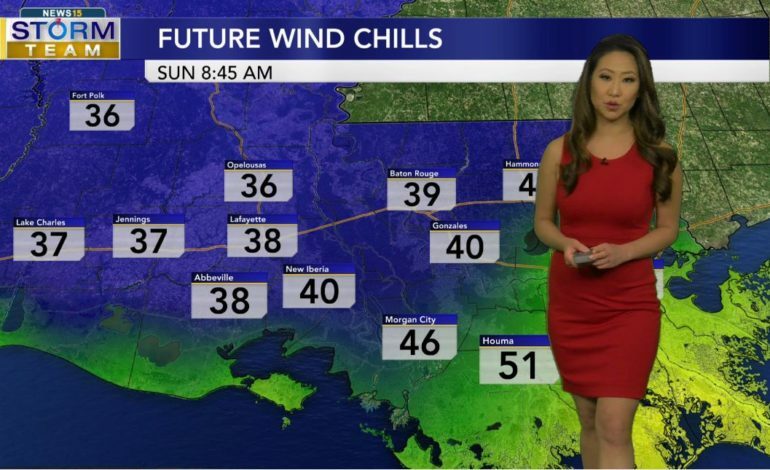 Monday morning will be chilly in the lower 40s with wind chill values in the upper 30s. Brrrr!! There will be a slight chance for showers as well. Tuesday morning will still be cold in the lower 40s but sunshine will help us gradually warm up with afternoon highs in the upper 60s. Clear skies and northerly winds will bring another chilly morning on Wednesday in the upper 40s but by the afternoon, sunshine and southerly winds will bring near average highs in the mid 70s. Even warmer temperatures are expected to round out the work week with showers once again on the way.